Wishing everyone the most amazing start to 2019. Happy New Year All! Tucked away in an amphitheatre setting amongst the vines, Obsidian offers tastings in a relaxed and friendly environment. The cellar door is situated next to a wetland area and vines. Al fresco tastings are often held under the pergol. 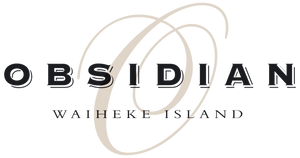 Our passionate and knowledgeable cellar door staff will take you through the range of Obsidian reserve and non reserve wines. Please click here to visit our cellar door page for opening hours. For other times, please call for an appointent at 09 372 6100. Bookings not required unless it is for a group of 8 or more and you have a special request: cellardoor@obsidian.co.nz or phone 09 372 6100. Obsidian is located in Onetangi 10km from the passenger ferry terminal at Matiatia and 5km from the vehicular ferry at Kennedy Point. We are situated at the bottom of Te Makiri Rd. off Sea View Rd. and part of the Onetangi Trophy Trail. By bus, you can either take the Hopper bus or Onetangi bus (and walk to the vineyard from the beach in 15 min. Walk up Seventh Ave. onto Sea View Rd. Turn left onto Te Makiri Rd.